Denman Theatre & Dance Col.
For those who grew up thinking the ukulele was a small plastic instrument producing a rather comical sound, think again. Uke player and long-time aficionado of the instrument, Jeffry Denman, has set the record straight. 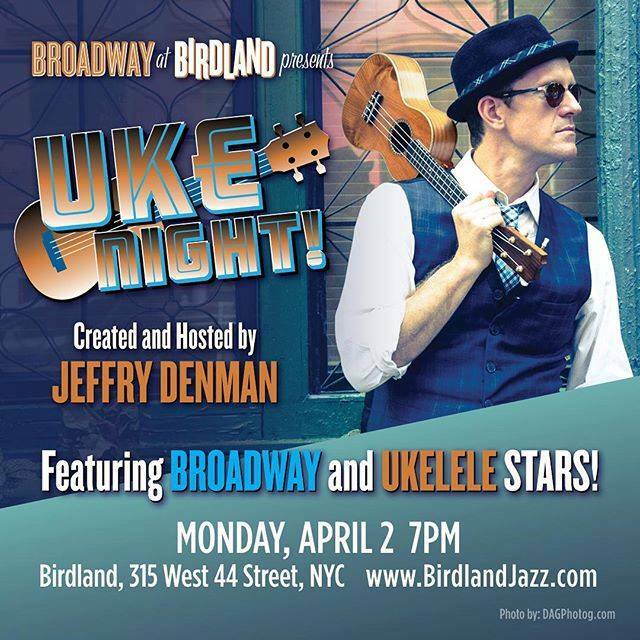 His wonderfully conceived and executed Uke Night featured about a dozen or so ukulele musicians of the first order, as a benefit for the Denman Theatre & Dance Co. (Denman is also an actor-dancer-director-choreographer). Jason Poole, who’s found a love of the uke and its exotic culture, led the show in full Hawaiian mode, allowing Denman to segue into a mini history lesson about the instrument. It turns out the ukulele is a late 19thcentury Hawaiian adaptation of the Portuguese branguinha, a member of the lute family. The ukulele got attention in 1915 at the Panama Pacific International Exposition and was instantly absorbed into America’s musical mainstream. It was rock and roll that did the uke in, and from the early 1960s until its reintroduction into popular culture in the 1990s, the once popular ukulele was little heard. To prove the point of the uke’s worth and charm, Martina DaSilva played and sang a beautifully phrased, splendid interpretation of the 1928 tune, “Laugh, Clown, Laugh” as it might have been presented then. The highlight of the show was ukulele virtuoso, Paul Hemmings, who, along with upright bass and drum accompaniment, played an extraordinary, musically sophisticated “In a Sentimental Mood.” Hemming’s rich arrangement included subtle hints of the Duke Ellington version recorded with saxophone great, John Coltrane. Hemmings easily demonstrated how, in a master’s hands, the ukulele is a valid solo instrument. Of course, no show would be complete without a Denman dance, and so, with Hemmings, the uke-master played a snippet of duet on “Lazy River” before launching into full-bodied tap. With Andy Taylor, the entire cast offered an exuberant Punch Brothers bluegrass tune, “My Oh My” and a gentler, mellow “God Only Knows,” ending a glorious tribute to the ukulele and its renaissance.